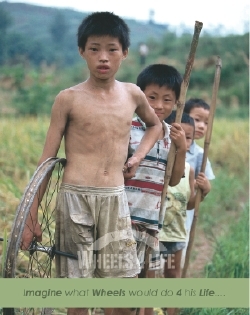 It is my pleasure to announce that I have just launched a non-profit charity called Wheels 4 Life: www.wheels4life.org. The goal of this charity is to provide thousands of people in Third World countries with bicycles so that they can elevate their standard of living. For many people, a bicycle can make all the difference to escape the vicious circle of the poverty trap. I have traveled to almost 60 countries, and have met and sometimes worked with people who make much less that $200 US per year. Often they live in remote villages and the only form of transportation they have is their feet. It is often too long of a walk to get to a job, go to school or to the market to sell their goods. Wheels 4 Life will also support healthcare workers, nurses and doctors to enable them to be more mobile, allowing them to see more patients in less time. I'm working with local agencies, organizations, schools and healthcare groups to assure the bikes donated will end up in the hands of people who really need them. All of my work is on a volunteer basis, and I pay all of my own expenses while working for W4L. We will keep administrative costs to a minimum to assure that the maximum amount of money goes to purchasing bikes. A donation of any amount is appreciated. For $150 we can buy a person a brand-new 6-speed bicycle that is specially designed for the rural areas and has durable, easy-to-replace components. This price includes all shipping, duty and tax costs.  Donate to our website. Any amount is appreciated. It's easy, fast, and secure to pay by credit card or PayPal at www.wheels4life.org.  Forward this message to your friends, family and co-workers.  Link the Wheels 4 Life website to your or your company's website (banners and buttons can be downloaded from our site).  If you are a media representative, I'd be very appreciative if you could give us a plug/write-up.  If you are a Corporation, please consider a Corporate Sponsorship for minimum of $1000 per year.